There is nothing special about the old metal building standing in quiet obscurity somewhere in Sherman. The building is the home of C&S Racing, but there is no sign outside, nothing to indicate that behind the plain walls and nondescript paint are some of the most famous and respected racing and sports cars ever to take a checkered flag. Elton ”Tony” Clark, whose passion runs to the light, quick Lotus automobiles of Colin Chapman, wants it that way. There is no need to call the outside world’s attention to the treasures inside. “I had a short and inglorious career in the early seventies as an amateur race car driver in Formula Vee cars that I built myself,” said Clark. Formula Vee was a single seat, open- wheel race car built from Volkswagen components and was a very competitive and very popular class in Sports Car Club of America— SCCA—racing. Chapman was an English engineer and former RAF flying officer. After a number of years tinkering with racing cars, he formed Lotus Engineering in 1952 and began to develop very competitive cars. Chapman was a minimalist. He wanted his cars to do the most with the least and he wanted to win. Performance was his raison d’être, and over the years he built racing machines that out performed just about everything else on the road. A Lotus 25 with Scotland’s Jimmy Clark behind the wheel brought Chapman his first Formula One Constructor’s Championship in 1963. Chapman and Clark brought a Lotus to the brickyard of the fabled Indianapolis Motor Speedway that same year, finishing second. They led the race in ’64 until a broken suspension stopped them. In 1965, they drove into the winner’s circle with Lotus-Ford, and the big, heavy, front-engine Offenhauser roadsters that had dominated Indy for decades were swept away in the slipstream. Chapman’s 1968 turbine-powered racer was so far ahead of the pack in its engineering that, although it did not win that year because of mechanical problems, the car was banished from further competition by the United States Auto Club. Tony Clark’s shop pays homage to Lotus and Formula One racing, passions he and his racing partner Dave Salls of Rockwall, share intently. Full of parts, tires, tools and tool boxes and machinery, it also houses the team’s race cars, show cars, and mementos—trophies, photographs, and various relics of races past. It is a home away from home for both men, a place to work on cars and get ready for the next race or watch some racing and kick back a cold brew with others who share their love of fast cars. “As you can see, it’s sort of a museum and a clubhouse. It’s more than just a shop,” Clark said as he stepped around and over the bits and pieces on the floor of the building that serves as meeting room and work area for the two men’s racing and restoration work. If neat and cluttered can describe the same thing, the shop is neat and cluttered. There are the cars (shiny, stylish Lotus vehicle) as well as the three flags hanging on a side wall; the Lone Star, the Stars and Stripes and the Union Jack. Tires, rims, and what seem like millions of parts and accessories pack shelves behind the cars. Opposite the flags are several bookcases weighed down with texts on every aspect of Lotus car history, repair, maintenance and racing one could dream existed. Toy race cars line one shelf, and two more adjacent bookshelves are littered with plaques, trophies, ribbons and photos. They bear witness to decades of racing and automobiles. There is even a bicycle, a Lotus-branded road-racing model above the entrance door. Clark is a lifelong Sherman resident, as well as a lifelong fan of Lotus race cars. A 1957 graduate of the University of North Texas, he served in the Air Force before returning to Sherman to operate a tractor dealership. From racing go-carts and motorbikes to high-performance formula cars, motorsports have always been a big part of Clark’s life. After retiring from the tractor business twelve years ago, he has found more time to pursue this—mania? Clark and Salls met in 2001 when Salls attended a Lotus open house at Clark’s shop. “I had about eight cars at that time,” Clark said. “We got to know each other, and Dave volunteered to help with the next event.” The two men now maintain several classic Lotus sports cars at the garage, some owned by Clark, some by Salls, including two cars solely for car shows and personal use. 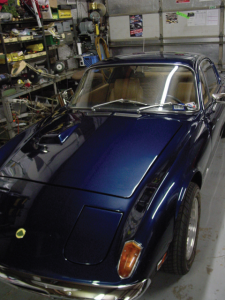 The team’s 1972 Elan Plus 2S is a sleek two-door machine in a brilliant dark blue, highlighted with original wood interiors. They bought it in 2000 and then completely overhauled it from top to bottom. Being restored is this 1972 Lotus Elan. The team also owns a red 1963 Elan SL, another pristine engineering marvel, but the star of the garage is the team’s 1968 Lotus 51 Formula Ford, so named for its British Ford Cortina engine. Painted a deep forest green with a foot-wide yellow stripe extending from hood to rear, traditional British racing colors, the open-wheeled design was built for speed on the track. Its racing number, “26,” adorns each side of the cockpit and the hood. Restoring a storied Lotus takes a little more than a set of Craftsman wrenches and a J.C. Whitney shop manual. “Over the years I have honed my talents to do a lot of the things I have to do. I can farm out a few things, but I’ve learned what I can handle and what I can’t,” said Clark. Finding a car is one thing; finding the parts to restore it is something else. Particularly difficult is Chapman’s need to use pieces from other cars and other manufacturers to finish off his products. The Lotus Elite (Clark used to have one) has an axle bearing whose sole other life was in an Italian tractor long since disappeared from the market place. Clark and a group of Elite owners persuaded, and paid handsomely for, the bearing manufacturer to specially produce a limited run of the rare part. Other parts, like door handles, were common-place on regular British production automobiles. Lotus did not build engines, so all the motors were supplied by independent builders, adding another layer of complexity to the rebuilding process. The Number 26 car races in the Formula Ford 1 class, featuring single-seat, open-wheel racers through the year 1972. With a 1600 cc engine, the car reaches 130 mph, a top speed for cars in similar classes and years. Race-ready, it weighs about 930 pounds. As a competitor in the Corinthian Vintage Auto Racing series, C&S has consistently been competitive in their division. In 2007-08, Salls drove the Formula Ford to second place the CVAR series, which incorporates road courses throughout the Southwest, including Eagle’s Canyon Raceway in Decatur, Hallett Motor Racing Circuit raceway in Jennings, Oklahoma, and Texas World Speedway in College Station. Road courses test a driver’s mettle, with frequent braking, gear shifting, and hair-pin turns. While the CVAR discourages “trading paint,” races do feature competitive driving and occasional crashes. These two friends’ passion for Lotus race cars spans decades and it brought them together. Whether they’re making repairs and refurbishing or buckling up and taking the wheel, their love of these British automobiles is unending, and they reflect proudly on all they’ve accomplished. Some call it a passion, my wife calls it a sickness,” Salls said with a laugh. And all the while, in a nondescript building, on a side street, in a back corner of Sherman, Texas, there’s a little bit of England and a larger bit of automotive history. Sean Chaffin contributed to this story. ← Apartment Development, Barometer of Growth? Did you ever race with my brother-in-law, Jack Griffin? I believe he was amateur driver of the year with his formula V in 1963. If you call him “Lil’ Tex,” the lawyers for the Texas State Fair will come swooping down with a cease and desist order. That’s why the 22-foot cowboy who stands near the intersection of FM 1417 and Plainview Road goes by an alias even though his resemblance to his more famous cousin is striking. Just off the square in Bonham, a little miracle is unfolding. ACT Communications, a local success story in the 1980s and 90s, is on the rise again.